Accuracy: Better than +/- 1/16" in 100 ft. 4 mm/100 m; 8 arc secs. Battery Life: 100 hours with 4 D Alkaline batteries. 40 hours with optional NiMH rechargeable battery. LS100 Detector and Rod Clamp included. 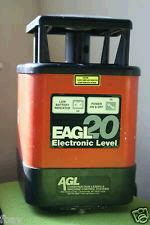 * Please call us for any questions on our laser eagl rentals in Fort Madison IA, serving Southeastern Iowa and Western Illinois.